With its robust portfolio, Red Hat ensures over 90% of Fortune 500 companies solve business challenges, including IT alignment with business strategy. But after consolidating disparate product store properties onto a unified enterprise level Drupal platform, Red Hat faced internal staffing bandwidth and talent sourcing challenges to keep it running. 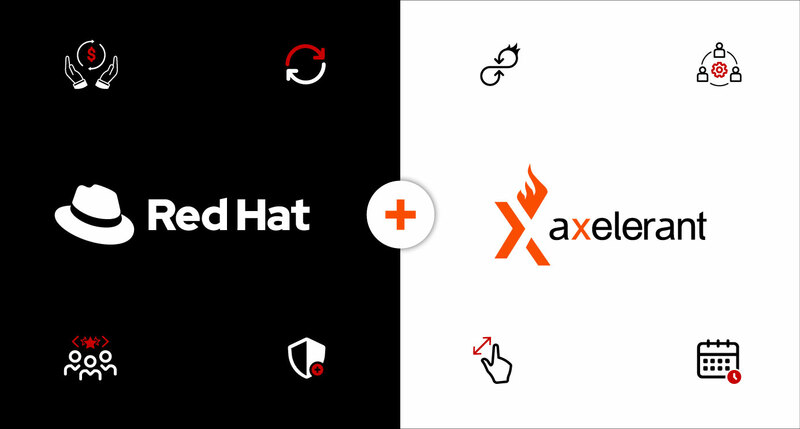 Axelerant has a long-standing, trusted partner relationship with Red Hat as demonstrated by having successfully delivered projects like The Enterprisers Project and Opensource.com. For this engagement Red Hat needed a team with preferred development processes and continuous integration experience already in place to build an enterprise product platform on Drupal 7 from day one. Multiple urgent eCommerce platform development needs made outsourcing too inefficient and insourcing unfeasible. As a result, Red Hat evaluated service providers with scalable, managed staffing capabilities—services suited to their situation. Five vetted Axelerant team members supported and supplemented Red Hat’s internal team during a six-month period to prevent costly understaffing. This partnership allowed Red Hat to conserve and reallocate high-value resources elsewhere while lowering overhead costs. By selecting Axelerant, Red Hat didn't need to hire short-term employees, and reduced insourcing pressures. Because of the nature of the managed staffing offer, Red Hat was able to strategically select the experienced talent the project required. The managed staffing solution bypasses inflated localized resource costs while keeping remotely engaged partnerships strong through the provision of a Success Manager (SM) who ensures timely and smooth deliveries, as well as big-picture insights. All of this combines to provide a customer success-focused staff augmentation engagement to expedite projects and reduce delivery risks like schedule, quality, budget, and retention. Due to an impending fixed deadline, Red Hat had to secure resources and scale quickly. Through Axelerant’s experience with accelerated solution delivery, Red Hat experienced easy and effective integrations of local and remote team members. By lowering the time to market for this platform, our ramp up became a strategic edge. Because of Red Hat priorities, project completion was due within six months. This meant that everyone involved had to proactively manage resource levels together to maintain needed delivery velocity per the timeline. To maintain this velocity, Axelerant up- or down-scaled resources based on short-term and long-terms demands raised by Red Hat, such as skillset readjustments or switches within the team. Further, planned backup staff augmentees stepped in during leave periods. Continuous delivery and continuous integration are development methodology advantages that Red Hat relies on which was implemented and supported by Axelerant's DevOps team. Further, remote staff augmentee timezone differences worked in the project’s favor to reduce turnaround time for feedback and deliverables acceptance.